Pastel Makeup Trend: Do I Spring for It? Trying makeup trends, at least once, is a lot of fun, but some makeup trends are a lot more difficult to pull off—I don’t care who you are. Pastel makeup is the latest trend for spring and, frankly, it scares me. Either I end up looking ashy because there’s not enough pigment in the makeup, or I end up choosing the wrong colors and looking cartoonish and crazy. Makeup artist Marc Cornwall, my longtime friend and collaborator, met me at my local Sephora to shop for a spring makeup-kit refresher. One of Marc’s best tricks for getting a deep, clear color is using a tinted eye shadow primer like Laura Mercier Eye Basics ($28). It’s pricey, but if you’re going in on the pastel or holographic look this season, it’s an investment that pays off in creating perfect eye shadow looks. The texture is heavenly. It goes on smooth and dry—most eye shadow primers are either kind of cakey, like MAC (which I use all the time), or wet, which means you have to wait while they dry. This always somehow leaves my eyelids feeling kinda dehydrated or tight. Laura Mercier Eyebright, a pale baby blue, works wonders under most pastel shades, but Marc warned me it could make a yellow shadow read a little green. Green, by the way, is one of the hardest pastel shades to wear because it can bring out yellow and red undertones in the skin in an unflattering way. Marc’s advice for women with darker skin tones from café au lait to dark chocolate is to choose a richer, golden yellow and a warm, baby blue shadow. Curate-them-yourself DIY shadow palettes are in just about every aisle at Sephora. Makeup for Ever offers a wide selection of colors in both matte and frosted finishes. We kept everything matte except for the iridescent, goldenrod color, which could be applied all over the eye or along the brow bone as highlighter. On the first slide above, clockwise, we chose I210 in blue, ME338 in goldenrod, I722 in peach and 1918 in lavender. The colors were deeply pigmented and came in a very cute package too, I might add, for $49. Steep and—considering the extra time needed to master using the unfamiliar colors, and the courage to endure the comments from my four teens—requires a commitment to using those colors on myself often enough to justify the price. Lancôme Amethyst eye shadow kit ($60), was love at first sight. Simple to use. Safe, but still on trend. I owe it to you and myself to punch up and wake up my spring makeup routine. Reasonably priced at $10. But wait—I don’t want to invest $137 on a trend I’m not sure I’m going to develop to the point where it’s my thing. Everything in my basket was beautiful, but honestly, I wasn’t ready to part with the money just to give it a try. Call me cheap; I don’t care. Call me practical, and now you’re speaking my language. I read that American women spend nearly a quarter of a million dollars on appearance in their lifetime. I’m probably 10 times as vain as the next person because of what I do for a living, but I’m not trying to go broke indulging it, either. Next move—the drugstore. Combing through the drugstore aisles takes time for sure, but with savings close to 80 percent, if you can find something that has enough pigment to pack a punch on dark skin, it’s certainly worth it, especially for experimenting. 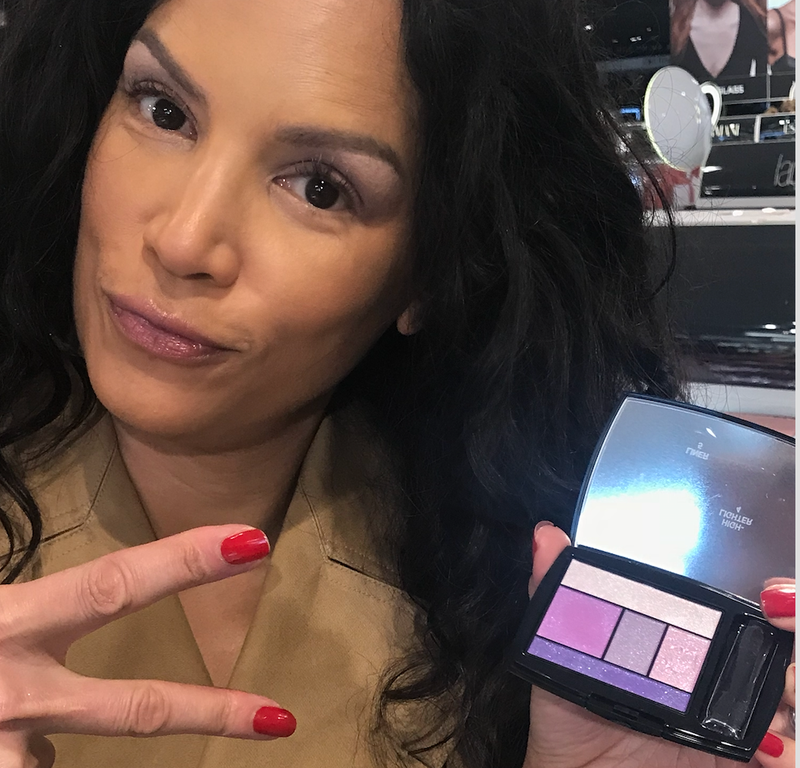 NYX HD eye shadow primer is a lot like the texture of Dior eye shadow primer; makeup artists use Dior all the time, and I plan to treat myself, too, when my MAC primer runs out. I like that NYX HD goes on dry and feels smooth and hydrating at the same time. The talc and beeswax combo in the ingredients do the trick in this case, and a little dab will do you for both lids. It’s waterproof, too. Cost: $5.89. Violet Amour eye shadow quad ($7.99) from L’Oreal was the perfect dupe for the baller Lancôme palette. (FYI, both brands have the same parent company.) The colors and quality are pretty similar but not exact—the packaging and presentation are worlds apart—but both give you the look. You pocket the difference, and that’s all anybody needs to know.